Hey friends! I have some exciting news – I’m a university graduate! Yup, I have a degree. On May 19th, 2016 I graduated from Mount Saint Vincent University with a Bachelor of Science in Applied Human Nutrition with Distinction. Yay! 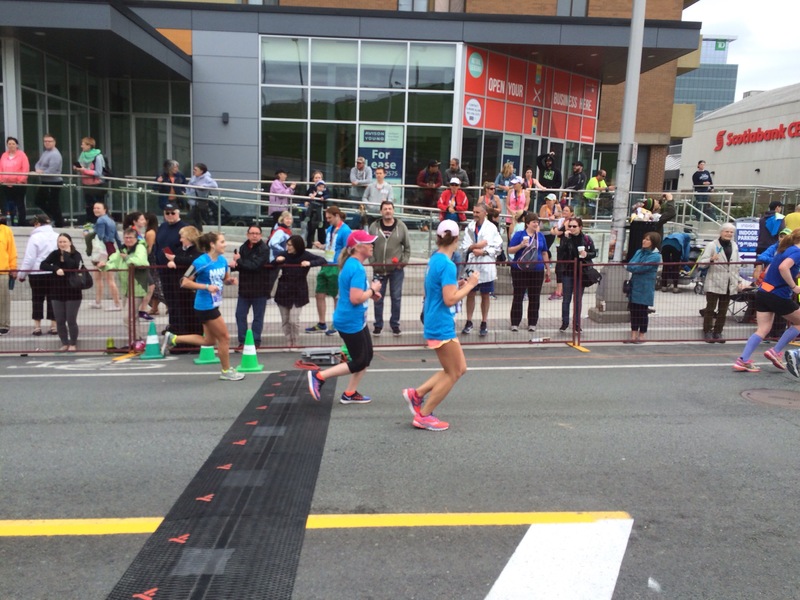 I thought it would be fun to share a little recap of my graduation weekend, which happened to involve running my first half marathon! So this post will be a mix of grad recap/race recap. The week of my graduation, both sets of my grandparents made the trip here to Halifax, Nova Scotia to attend the ceremony and spend some quality time. It was so fun having them here! My convocation was a morning ceremony so the day of I was up early to get ready, have a good breakfast, snap some photos and then get to the auditorium on time. For breakfast I had a simple Peanut butter and banana sandwich on whole wheat. Sorry foodies, I forgot to snap a pic – and the one my mother took of me eating it isn’t all that flattering. Before we headed to the auditorium we took some photos at home. The ceremony was actually quite bearable as we know that graduation/convocation ceremonies aren’t always the most entertaining. It lasted about two hours and no, I didn’t trip on stage. Afterwards we took some more photos on campus outside of the auditorium. Once all of the photo taking was said and done, we headed home to grab lunch and then get to work prepping for the party! My mom had planned a little graduation party for me and we invited my family, family friends, and my best friends from high school who are all home for the summer. I planned the menu (of course) and it consisted of lots of appetizer plates like veggies/fruit and dip, Oh She Glows nacho dip, homemade hummus, crackers, etc. and then grilled meat/veggie kabobs and lots of fresh salads. For dessert, mom made cupcakes, I made vegan brownies, and we also served fresh berries and ice cream. It was all SO GOOD. All in all it was such a lovely night celebrating with my closest friends and family. 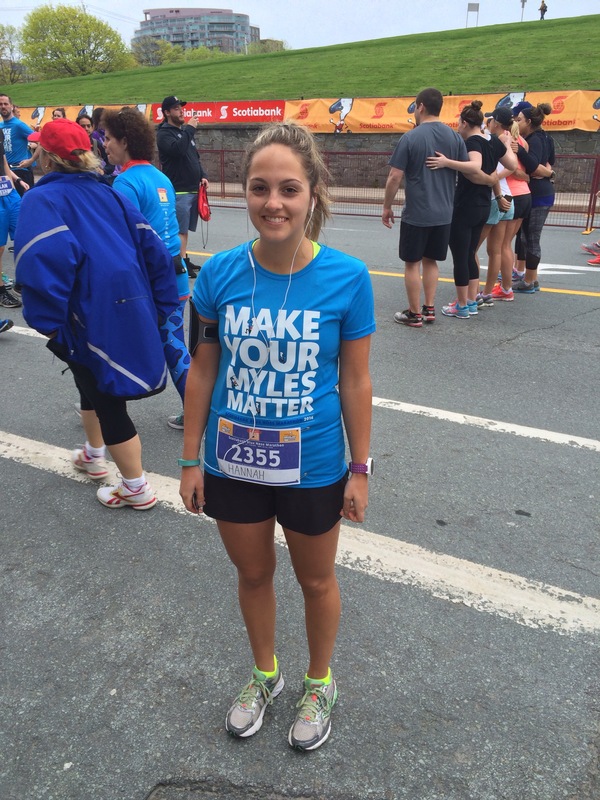 I took the next two days to rest and fuel up for my first half marathon! 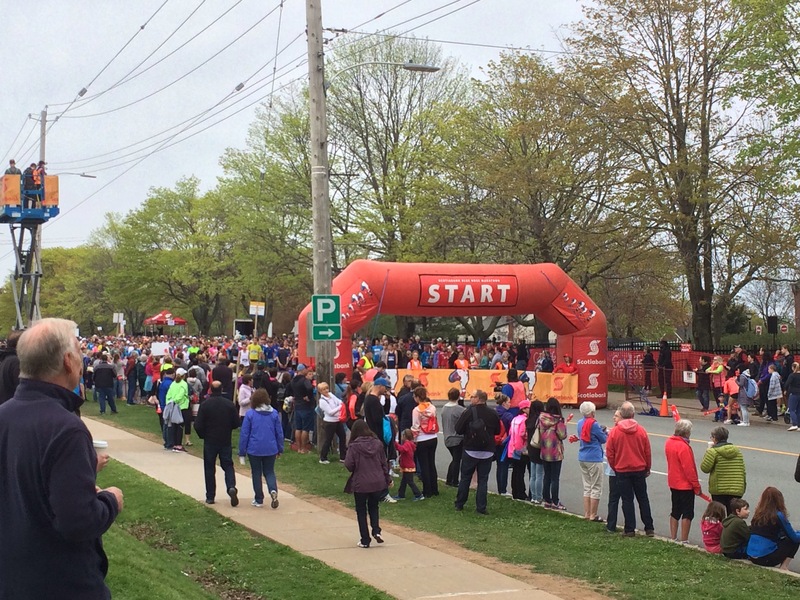 I ran the Bluenose Half Marathon 2016 on May 22nd, 2016. Read on for my race day deets. 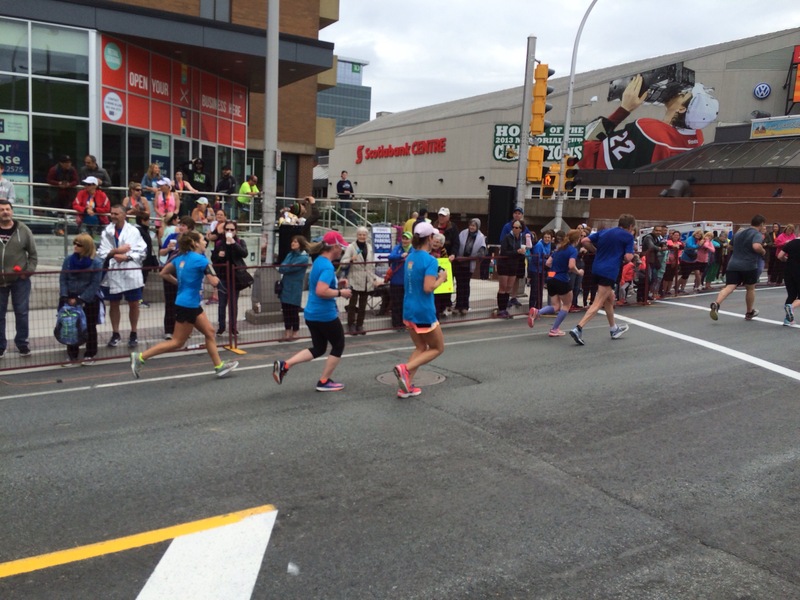 The Canadian Victoria Day weekend in Halifax, Nova Scotia means Bluenose Marathon weekend! 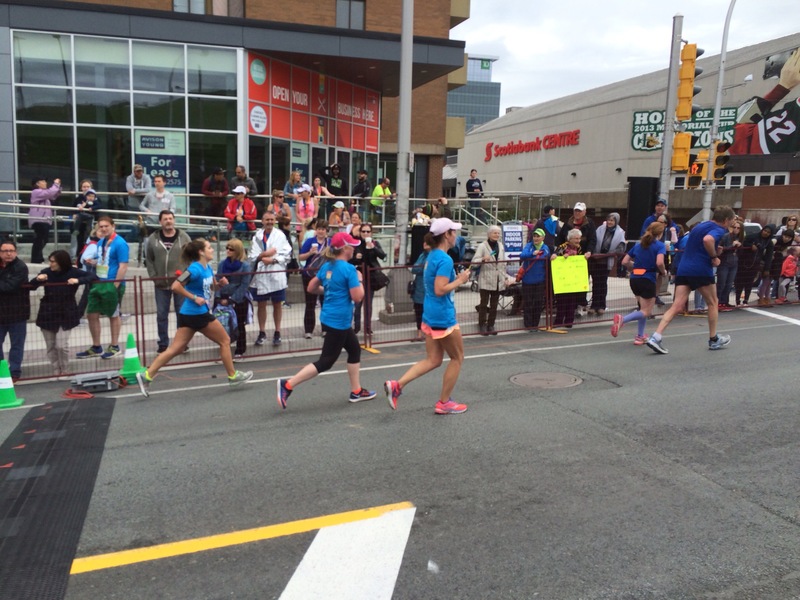 Runners come from all around to run the streets of Halifax and Dartmouth (except for this year due to bridge construction) in the 5k, 10k, Half-marathon, and Full-marathon races. I’ve wanted to run a half marathon for a while now and I actually didn’t register for the race until about a week before because I was unsure about how I was going to be feeling training-wise as I had just recently returned home from vacation. Luckily, I was still feeling great, I had trained well (not my hardest, but well) and I knew I would be able to run the race. Would I be able to run it in my goal time? Probably not. 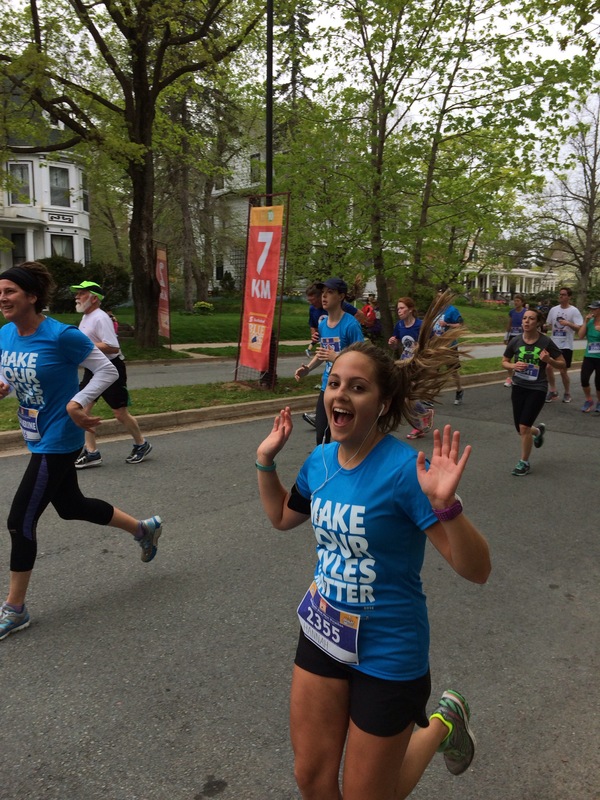 But hey, it was my first half marathon, I just wanted to have fun with it. The morning of the race I woke up around 6:00 am. My start time was 8:20 so I woke up, immediately dressed and ate my breakfast (oatmeal bake) that I had prepped ahead of time. I knew oatmeal bake was going to be a good breakfast option for me because it’s a staple that I’ve eaten before several long runs this year so I knew there wouldn’t be any stomach issues along the course. My boyfriend accompanied me to my start line, where I waited in a very long line to pee before the race (they’re not joking when they say marathon bathroom line-ups are long). After that I had about 10 minutes until the start so I headed to the Start where I took my first gel. I haven’t used gels when training, and they say not to experiment on race day but the entire race was basically an experiment so I thought why not. Soon enough, the race started and we were on our way. It was so exciting as there was so much cheering and enthusiasm around me that the first 5km went by in no time and soon enough I hit 10k, under an hour. Around 12k I took my second gel at a water station and kept on feeling strong. It wasn’t until around the 17km mark that my legs started to feel heavy and the fatigue kicked in. Right around there, there was a massive hill in Point Pleasant Park that really took a toll on me. I had trained on plenty of hills, and had felt awesome going up all of the hills thus far, but going up this big one as the fatigue was setting in really slowed me down. 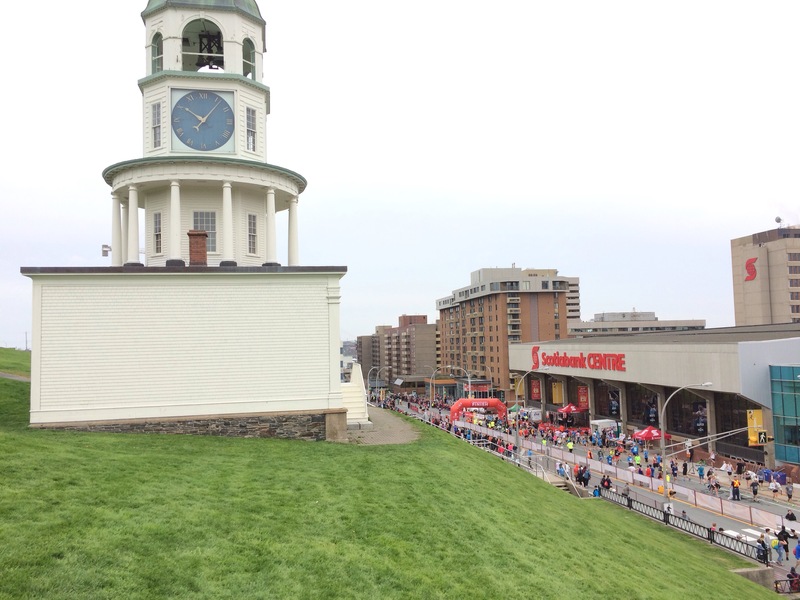 From there on, the last 4 km felt pretty darn terrible. I wanted to stop, I couldn’t smile at the cheering spectators, and I was battling with my brain that kept telling me I couldn’t do it. 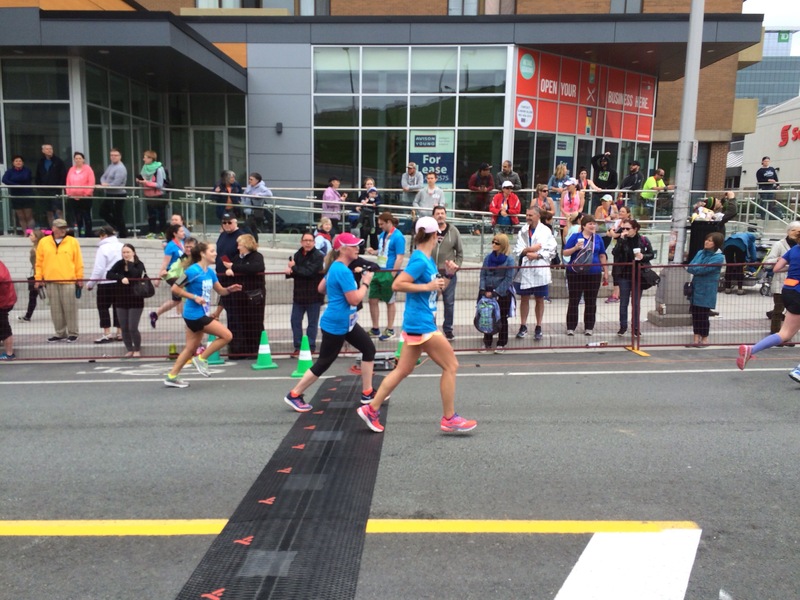 Those last few kilometres felt like they took forever, and compared to my usual pace, they probably did. I was also pretty disappointed that at the 20 km mark (1.1 km to go!) there was literally no spectators clapping or cheering. Maybe they were tired after cheering for a while but come on, this is where us runners needed it most! 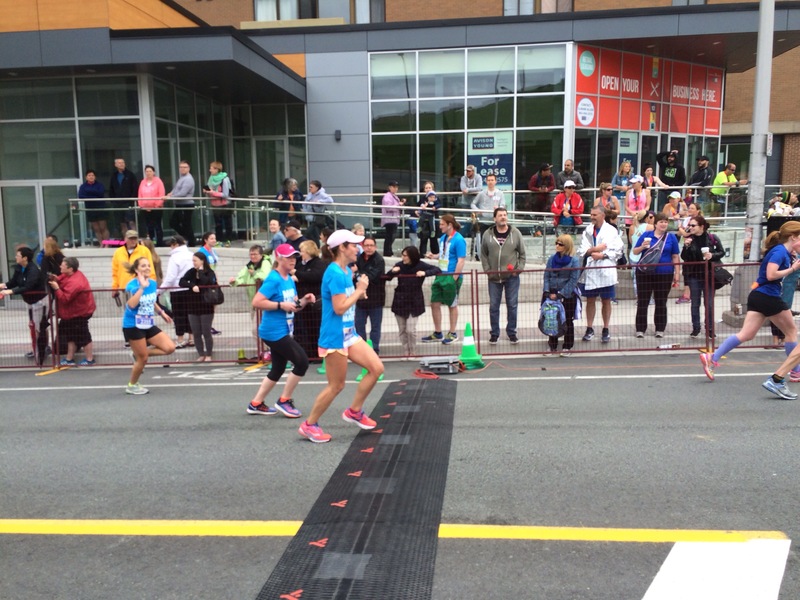 I am sure that if there was more encouragement from the crowd at that point, I would have felt 100x better pushing to the finish line. Regardless, I kept going, disregarding how much fatigue I was feeling and eventually sprinted up the final hill to the finish line in 2:08. My goal was to finish around 2 hours. 2:08 was a little disappointing for me but looking back I can see where my physical/mental fatigue got the best of me, and I can only get better for next time! I definitely wasn’t and will not dwell on my time, it was my first race! I’m so glad I did it and about an hour after the race I said to my boyfriend “I want to do another one!” and “I want to get faster!”. I can’t wait to train way harder for my next race and see what I can accomplish! 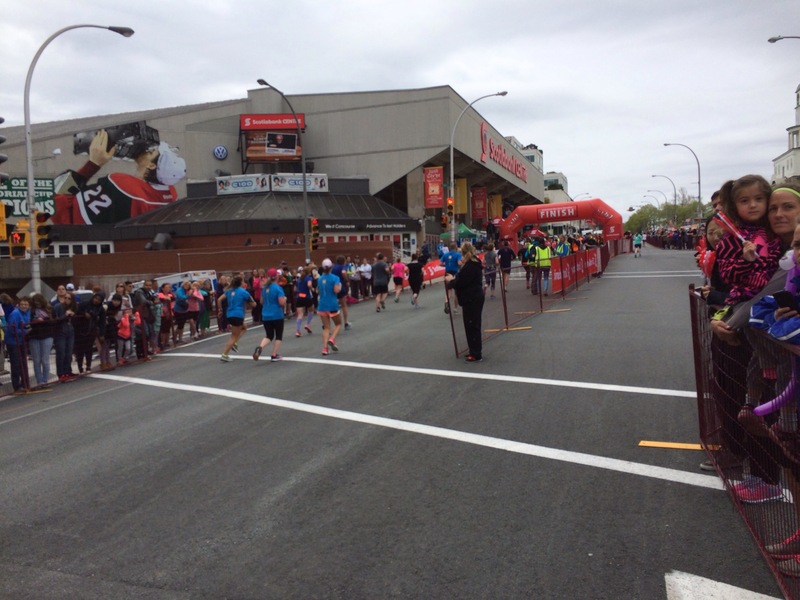 It was a great experience, graduating university and running my first half. What a weekend! So proud of all your accomplishments. You rock!